Explanation: There was a shower over Monument Valley -- but not water. Meteors. 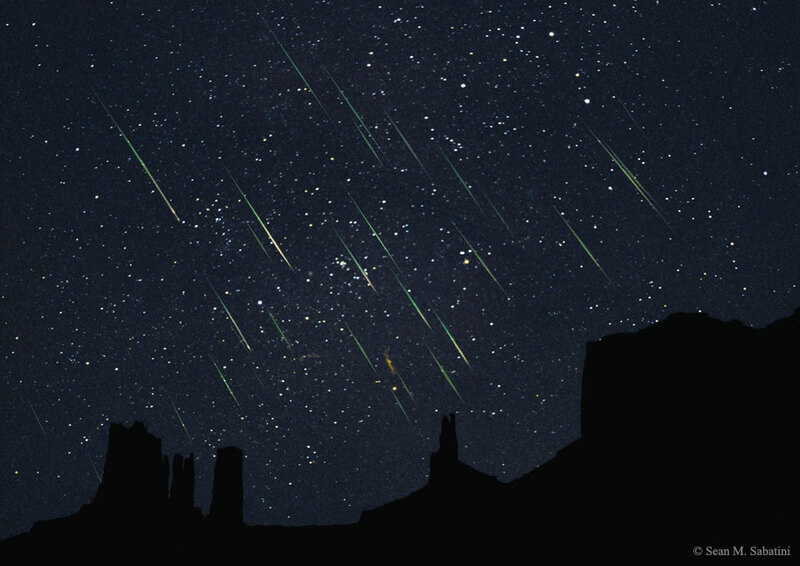 The featured image -- actually a composite of six exposures of about 30 seconds each -- was taken in 2001, a year when there was a very active Leonids shower. At that time, Earth was moving through a particularly dense swarm of sand-sized debris from Comet Tempel-Tuttle, so that meteor rates approached one visible streak per second. The meteors appear parallel because they all fall to Earth from the meteor shower radiant -- a point on the sky towards the constellation of the Lion (Leo). The yearly Leonids meteor shower peaks again this week. Although the Moon's glow should not obstruct the visibility of many meteors, this year's shower will peak with perhaps 15 meteors visible in an hour, a rate which is good but not expected to rival the 2001 Leonids. By the way -- how many meteors can you identify in the featured image?